I recently discovered the world of flexagons. Flexagons are toys constructed of folded paper that can be manipulated to reveal hidden faces. 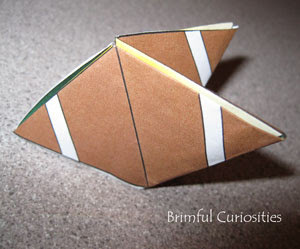 Since the Super Bowl is this weekend and our beloved Packers are playing, I decided that it would be a fun challenge to design a football flexagon craft. The double triangle shapes used to a make trihexaflexagon (hexagon shaped flexagon with three faces) look a lot like a football. 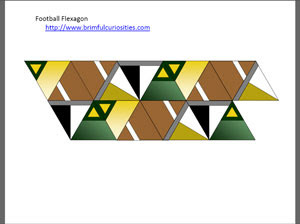 I designed the football pattern template so that you can flip between the Green Bay and Pittsburgh team colors. Be sure to show-off your impressive paper toy to your friends at a Super Bowl party this weekend! The flexagon is fun for both kids and adults! A couple tips: The flexagon works better if you let the ink and glue dry before trying to flex it. If the paper is saturated it won't snap and fold as well. Also, try to be as accurate as possible when cutting and assembling so that all the corners match when flipping between the faces. I'm not a football fan, but my son is. I printed one off for him to put together later. Thanks for sharing this project. Any ideas on how to make a Cheesehead hat??? Our grandson has decided he needs one for the game!